Kommal and Ratul Sood’s collection, following a gothic theme, was heavy on velvet. Hues such as brown, green, aubergine and teal were seen on jackets, trousers and suits, giving them a luxe, festive-ready look. Nitin Bal Chauhan and Kommal and Ratul Sood paid special attention to monochromatic colour schemes. While the former turned heads with black sketch prints against white backgrounds, the latter created a striking look with a co-ordinated ensemble of jacket, trousers and shirt in the same print. Pleated frills and ruffles were a prominent feature of Dolly J’s collection. Red carpet-ready gowns with asymmetrical hems were paired with intricate ruffled detailing on the body and skirt in a cascading effect. Feathers, used as luxe embellishments in Pallavi Mohan’s sheer and metallic gowns, continues to be huge for winter. Boasting a jewel-toned colour scheme, the collection is inspired by Simply Studio 54, a glamorous Manhattan nightclub and discotheque popular in the ’70s. Amrich by Amit and Richard went with large box checks on handloomed and handwoven fabrics to create an impression on the runway. A co-ordinated jacket and trouser ensemble of black and white box checks was the defining look. The Bohemian aesthetic is perfect for summer but Vineet Bahl made it work for Autumn/Winter with his collection of vintage floral-printed dresses, baggy trousers and tunics. There was also a focus on embroidered detailing and voluminous sleeves. 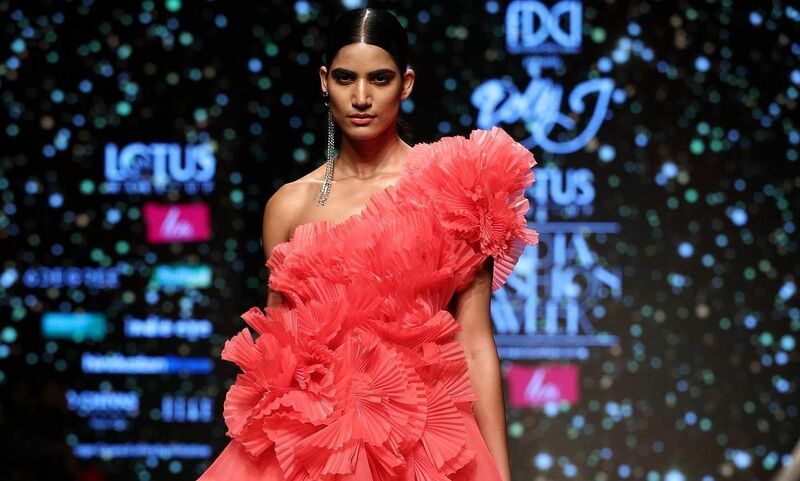 Manoviraj Khosla and Charu Parashar threw out the rulebooks and went with fall florals for men. In Manoviraj’s collection, floral embroidery and prints found their way onto leather and waterfall jackets. Charu, on the other hand, stuck to dark floral prints on athleisure jackets and track pants.